INCLUDES 13 CLASSIC GAMES – Play these favorites: Pac-Man, Ms. Pac-Man, Galaga, Dig Dug, Galaxian, Pac-Mania, Galaga ’88, Mappy, Xevious, Rolling Thunder, Dragon Spirit, Rally-X, and Bosconian. Make your childhood dream come true by having your very own home arcade game machine in a convenient tabletop size. 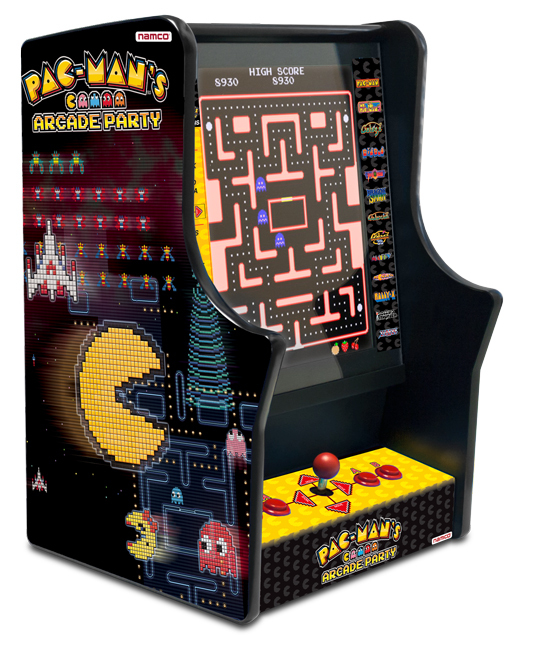 The Pac-Man’s Arcade Party is the licensed counter top version of the full-sized arcade game. It features 13 classic games, an impressive 17-inch LCD screen with full-color graphics, sounds, and arcade-style controls. 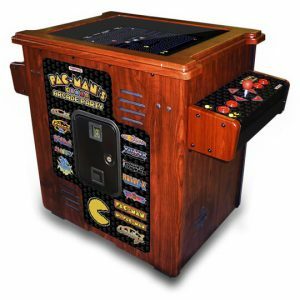 This game machine is not coin operated and will look great in any home game room, entertainment den, or bar. It weighs only 52 pounds and at 2-feet tall, you can set it a sturdy surface to your preferred height and play. Have family and friends take turns beating your high score. This Pac Man mini arcade game is sold by Dazadi. 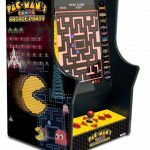 LICENSED TABLETOP PAC-MAN GAME – This bartop version of the original arcade game machine features a sturdy cabinet with full-color images of the Pac-Man and Galaga games. 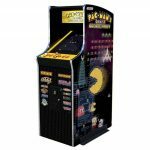 17-INCH LCD SCREEN, AUTHENTIC JOYSTICK and CONTROLS – Play this mini Pac-Man arcade machine with authentic joystick and controls and its 17-inch LCD screen, full color graphics and sounds. PERFECT FOR HOME GAME ROOM, REC ROOM AND BAR – When you add this to your home game room or rec room, this retro arcade game machine will keep everyone, of any age, entertained for hours on end. Packed with 13 classic arcade games: Pac-Man, Ms. Pac-Man, Galaga, Rally X, Mappy, Xevious, Galaxian, Pac-Mania, Rolling Thunder, Bosconian, Dragon Spirit, Galaga ’88 and Dig Dug.